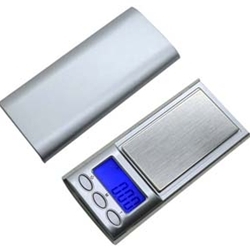 This BRAND NEW "Fire" digital pocket scale manufactured by US Balance features a blue backlight and easy 3 button controls. This tiny wonder features remarkably high precision for a scale this size, down to 1 hundredth of a gram! Ready to use out of the box. The slim and stylish Fire is perfect for measuring herbs, spices, or jewelry, and comes with a long lasting CR2032 battery for extended life. - Overall Size: 3.6" x 1.7" x 0.5"
- Platform Size: 2.2" X 1.2"